Which dyno to buy? How to choose a right one. How to compare dynamometers available on the market? 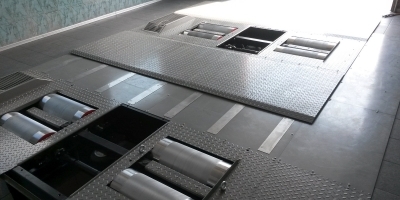 Each chassis dynamometer consists of three components: hardware, software and technology of measurement used. This is trivial, but these three components must perfectly cooperate. Moreover, the lack of capabilities of hardware cannot be “repaired” by software or technology and vice-versa. All the components must be perfect. 4wd dynamometer with linked axles (axle synchronization) – is that good? 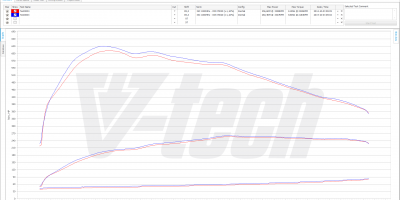 All VtechDyno 4wd (4x4) dynos have full front to rear synchronization as standard. This means that front and rear rolls rotate with exactly the same speed (of course only if sync axles, so called „synchronization” is enabled). Such linked axles functionality is offered usually as option by other dyno manufacturers, or is not available at all. The question is: is such synchronization important for nowadays cars? Reading the graph of the chassis dynamometer pull is not difficult. Typical chassis dyno (rolling road) graph is arranged like this: the horizontal axis shows the engine speed (or alternatively – car speed) and the vertical (or two vertical, mainly on the left and right side of the graph) power, torque and optionally other logged parameters (eg. turbo pressure, lambda, AFR, exhaust gas temperature or the rate of smoking, OBD logs etc/). As new, modern modular rolling roads may be expensive, especially at the beginning of a new business, used dynos for sale are listed in various internet pages. There are some better and worse developed dynamometers, but in most cases the whole idea of chassis dyno is common – a steel crate with rollers, sometimes twin-rollers. 4Wd (4x4) dynos may have front axle connected to rear with the belt or drive shaft, but most older dynos have no front-to-rear connection and are intended to stabilize and equalize roller speeds with electromagnetic brakes. Wheel power or engine power? 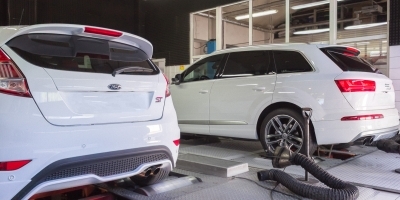 It is common to use dyno results (dyno graphs) for various cars to compare their capabilities, potential accelerations and driveability. Internet pages are full of more or less accurate dynamometer pulls results. In most cases, these results are comparable at least according to standards used (most popular are SAE in USA, DIN across Europe), but painful fact is, that they are widely uncomparable across continents: in America wheel power is king. Europe relies on engine power. As there are various solutions and devices available at the market for performance measurement of motorized vehicles (cars, trucks, bikes, agricultural machines etc), people interested in buying dynamometer, or dynamometer alternative may be confused. 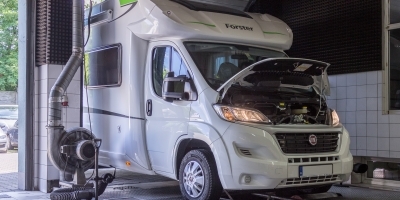 Is that a good idea to spend more on regular chassis dynamometer? 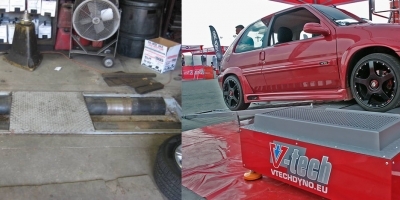 Is so called „road dyno” or „wheel dynamometer” (device connected to one of car wheels) a good equivalent for proffesional power and torque measurement tool? 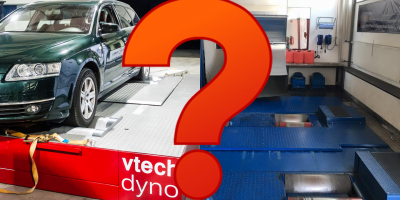 Chassis dynamometer - how does it work? Dynamometer (aka rolling-road, dyno or Leistungpruefstand) is a mechanical device for measuring power and torque of a car, bike, truck or even an agricultural machine. 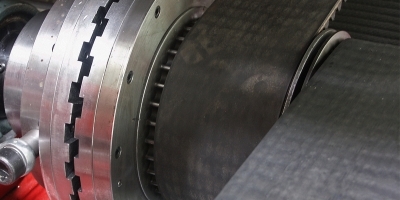 The torque produced by an engine is converted to traction force by transmission (gearbox, differential) at wheels. You may ask – where is the place for „power” then? Power is the torque of the engine multiplied by the rotation speed – so it is enough to measure traction force to be able to calculate the wheel power of a car, truck, motorbike. Of course our dynamometer must know noticeably more to show us the real power of the engine – power losses must be measured, also the dyno must know the transmission ratio (wheel speed to engine speed ratio) or directly the engine speed (for instance – from OBD port or CANBUS of the car).